Ambiance® is an "environment enhancer" designed to help you create the perfect ambient atmosphere to relax, focus or reminisce on the go. Choose from over 3500 free sounds, exclusive to Ambiance, to download and listen to, create customized sound mixes, cycle through playlists, wake up to relaxing sounds and more! Requirements: Compatible with most devices. Requires Android OS 2.2 or later. WiFi, 4G, 3G or Edge, Network connection sometimes required. 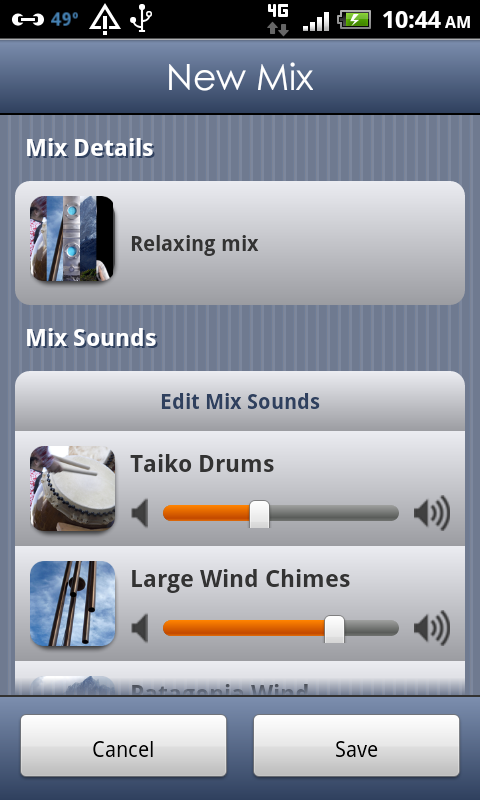 The Ambiance player loops your sounds and mixes seamlessly. Easily download new Ambiance sounds in an familiar way. Preview Ambiance sounds and only download the sounds you want. Only download the sounds you want. With more sounds added frequently, the Ambiance library keeps growing! If your device supports it, we will even send you a Push Notification to let you know. Who says you have to be focused on your Ambiance environment all the time? Play Ambiance in the background as you check email, surf the web, or play games. Fall asleep to a comforting sound so you can doze off gently as it fades out. Wake up gently to a sound fading in slowly so that you can start your day off right. Choose From over 3500 Sounds, Organized by Category. 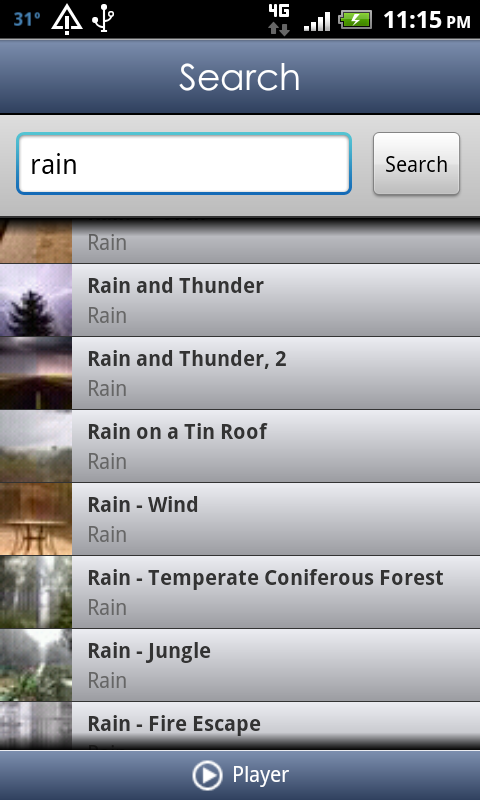 Browse through the store and explore categories such as "Rain", "Urban Indoors", "Household" and more. Easily Find What You Are Looking For Search or browse through the free Ambiance store. Full-screen HD images accompany every sound Help put yourself in a new environment with both amazing sounds and amazing images. Full text descriptions accompany every sound Learn more about what you are listening to. No network connection needed After downloading your sounds, you do not need a network connection to play sounds. Full landscape support Everything in Ambiance can be rotated this way and that. Fully Customizable Player Timer Want to fade out the player while you nap for 1/2 hour? Easy. Full-featured Ambiance sound player Play, Pause, Previous, Next, Shuffle, all the standards. Ambiance player quick-button Quick and easy access to the player from every screen. Rate your sounds to help you find them later What was that 5-star sound I listened to last week...? Oh ya, here it is. Predictive Search Just type a few letters and we will figure it out. Download Queues Download multiple sounds at a time and keep track of them in the Download manager. Downloaded sounds are categorized for you You should not have to worry about organizing your sounds, let us handle it. Flag Sounds Help us give you the best of the best by letting us know if something is wrong. Add your favorites Make favorite lists for quick access to your favorite sounds. Background Alarms Even if Ambiance is running in the background, the alarm will go off. Facebook, Twitter Integration Share any sound or with your social networks. Request a sound All sounds start as customer requests. If you want a sound we don't have, just ask. In-App Help and Feedback Get answers within the app if you need it. I love the idea of this app. All the sounds are of crystal clear quality. 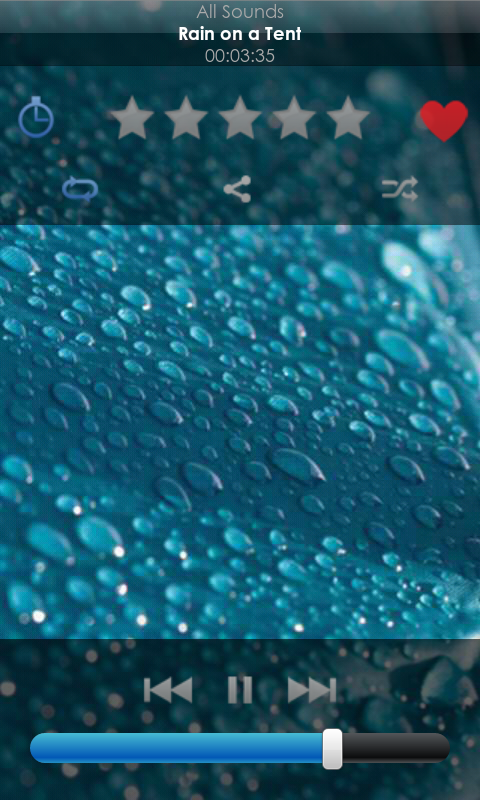 Whenever I need to buckle down and study I turn on the rain sound and it creates the perfect work environment for me. Highly recommended. This thing is PERFECT! I paid $30 for a "sound machine" that had about 1% of what this has. This is incredible! This should come standard on every phone. Realistic sounds, gorgeous pictures, lots of options. Worth way more than asking price for all the work put into this. Thanks! By far the best of its kind on Android. Used the app on iOS and missed it greatly. Great developer. You will not regret the purchase. Love the app. Incredible amount of sounds to pick from. Love also how you can create your own sound mix. I very much recomend it. There are so many good sounds. Just what I was looking for! This app is easy to use and very useful. I especially like the timer mode so that my Kindle Fire turns itself off once I'm asleep. 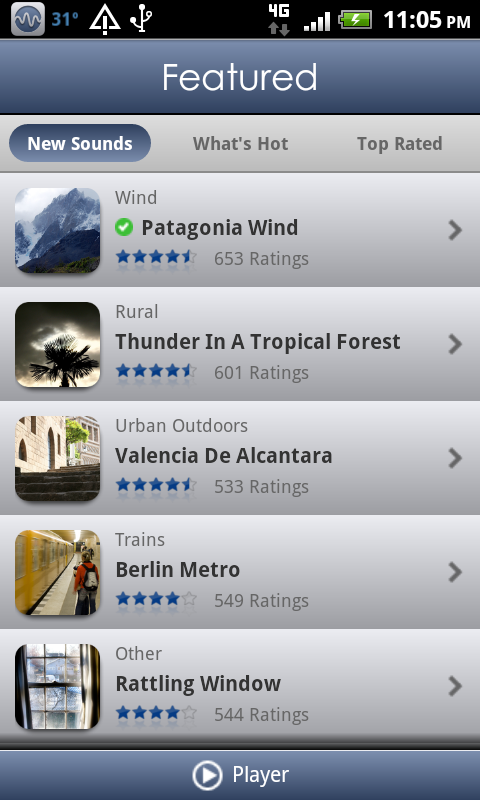 This was the only App I was missing from my iPhone. Now I will never regret going Android! AWESOME APP!! The sounds are very realistic and there are so many to chose from. I listen to this all the time. 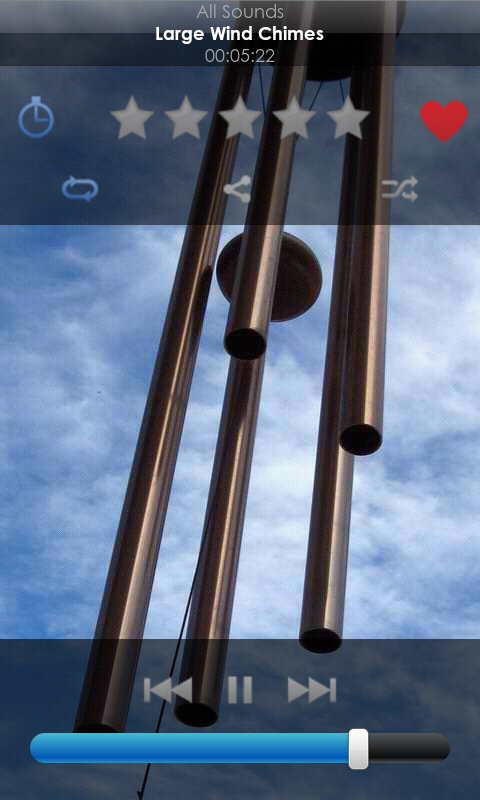 This is by far the best ambient noise app out there. This was the only app I missed when I transitioned from apple over to android. The library is extensive with seamless sound clips. Well done! 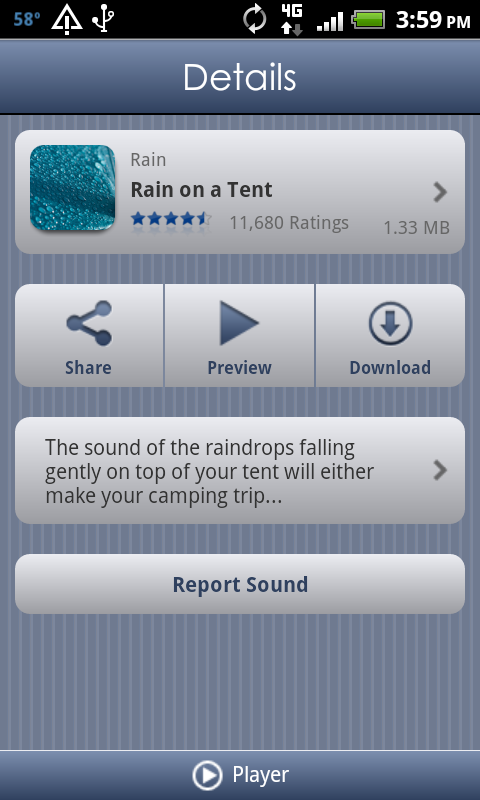 This is a great application with so many high quality sounds to download. The great thing is that the sounds are automatically categorized by category and are maintenance free. Absolutely love this. I love the sound of rain and thunderstorms while I sleep and having the ability to create a mix of that is worth the buy in cost of $2.99 for the app. Ambiance really is amazing ... This is one app you’ll use time and time again ... I highly recommend you check it out. Ambiance is a perfect companion, providing relaxing and soothing sounds to drain the tension and stress out. FixedMade buttons easier to tap. FixedUpdated image icons to be sharper. CriticalFixed a bug where the app would claim to be a beta copy and self-expire. FixedSharper images have been added throughout the app. FixedThe status bar notification style on some devices were not formatted correctly. FixedTapping on a status bar notification would not direct you to the right place. FixedAlarm fade in times could be miscalculated or not triggered. FixedIn low-memory situations, Ambiance could stop playing. FixedAlarm enable/disable button was hard to tap. NewAmbiance has been re-released on the Google Marketplace. Ambiance is the only app of its kind. With an ever-growing collection of sounds for you to download from, advanced features and customization, and a gorgeous appearance, Ambiance has become a must-have app on all devices. Find out what Millions of Customers are raving about! Ambiance will work on all Android phones and tablets running Android OS 2.2 or higher and is currently available for purchase on the Android Marketplace and Amazon Appstore. Upgrading from the Old Version of Ambiance? Customers of the original Ambiance Android app in 2010 can receive a refund for a purchase of the new version of Ambiance. Once you download the new version of Ambiance from the Android Marketplace or Amazon Appstore, Please contact us with both your new, and previous order details and we’ll refund your original purchase.